← My Daily Spin – What Will I Do with This Silk Yarn? The CSA deliveries from Pinckney’s Produce have FINALLY started up again, hooray! Which means lots of yummy options for this week’s meals. The first delivery included arugula, bok choy, collard greens, spring onions, and strawberries. The strawberries, of course, only lasted about a day. They were delicious! I’ll also roast a whole chicken stuffed with lemon and rosemary. 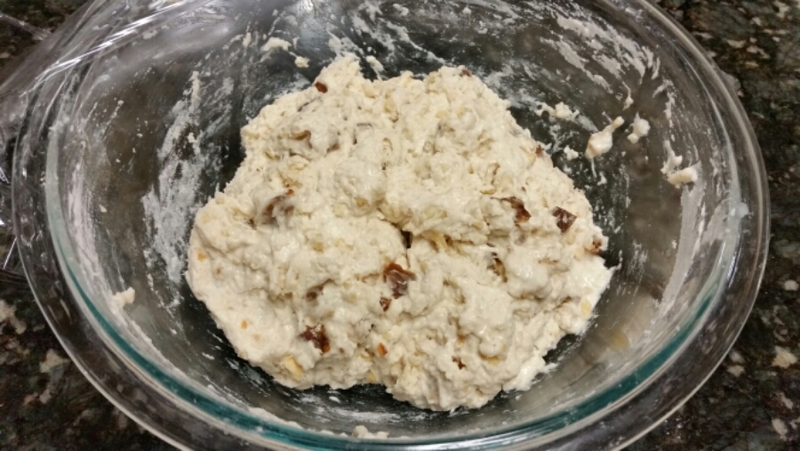 And I’m baking bread with almonds and apricots. The bread is dead simple. Flour, salt, yeast, and water with whatever mix-ins you care to try. You let it rise overnight then bake it in a cast iron dutch oven. So far I’ve made it with lemon and gruyere, and with roasted garlic and Parrano. To get a head start, so tomorrow’s not so busy, I cooked the collards dish and packed that part of my lunches. Tomorrow I’ll do the rest.